Here's our Nautical Stencil collection full of creative and fun beach decor designs! This collection will instantly bring coastal casual elegance to your home. Our nautical stencil designs work beautifully in any room, from the living room in your beach house to a nautical-themed nursery. 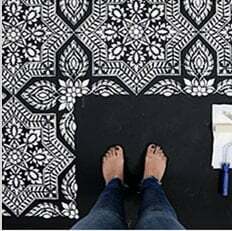 Choose the perfect stencil that fits your decor: from popular Anchor stencil and Starfish stencils to beautiful allover patterns such as Fish school allover or our Scallop pattern. We have a Mermaid stencil and popular Fishscale Tile Stencils too! Many of our nautical stencils come in various sizes, so you'll certainly find something that fits your DIY project perfectly. Learn How To stencil - it's easy and fun!